Still cleaning up after Harvey? You’re not alone. Check out the Southwest Center for Occupational and Environmental Health’s Hurricane Harvey website for tips on how to recover safely from the storm. The website features a list of web resources to use as a guide for cleanup and recovery efforts, articles on removing mold and protecting yourself during cleanup, and videos in English and Spanish on how to wear protective masks correctly. Mold can cause nasal stuffiness, throat irritation, coughing or wheezing, eye and skin irritation, and is particularly problematic for people with asthma, allergies, or compromised immune systems. Life-threatening risks during flood remediation can include electrocution, carbon monoxide poisoning, or other injuries. 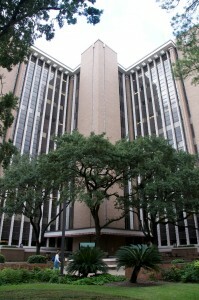 SWCOEH is housed within the Department of Epidemiology, Human Genetics and Environmental Sciences of UTHealth School of Public Health. The center has played an active role in Harvey recovery, including conducting environmental monitoring for flood-damaged neighborhoods and providing health and safety supplies and training to residents and workers. The SWCOEH is also collaborating with Baylor College of Medicine, Texas A&M University and Oregon State University on a study to investigate the short and long-term health effects related to the flooding and potential exposures.